Hi All! We’re already here at the week before Easter. 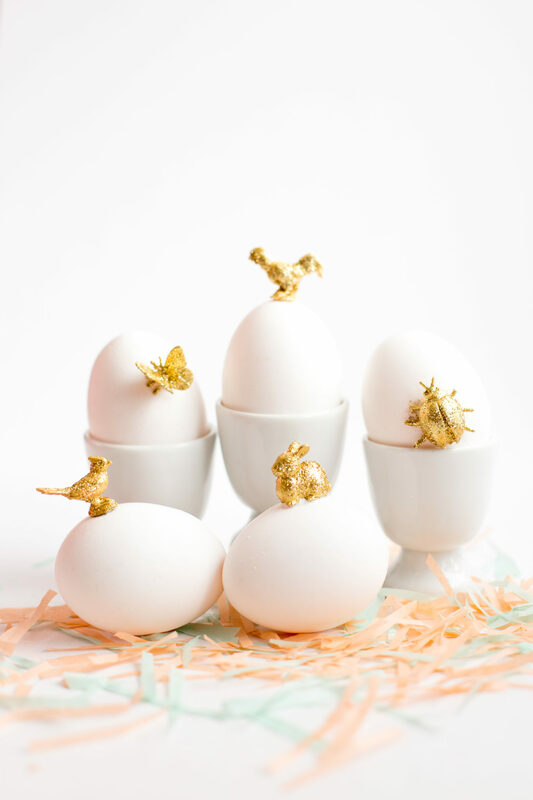 I hope you love this Golden Animal Easter Eggs DIY as much as I do. Allie, my daughter, and I came across these little animal figurines at Michael’s and the idea popped into my head. The design is so clean and simple, yet whimsical and happy making! 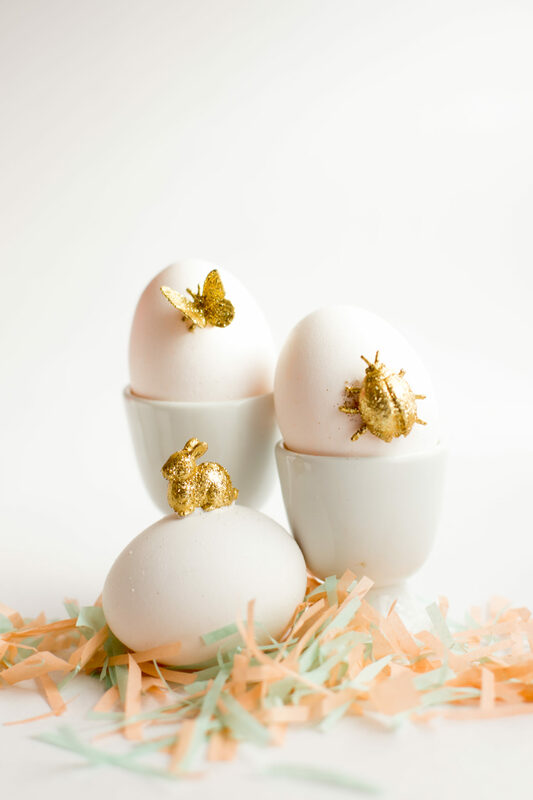 I grabbed the most springy animals of the collection, but gold and glitter makes almost anything adorable, don’t you think? 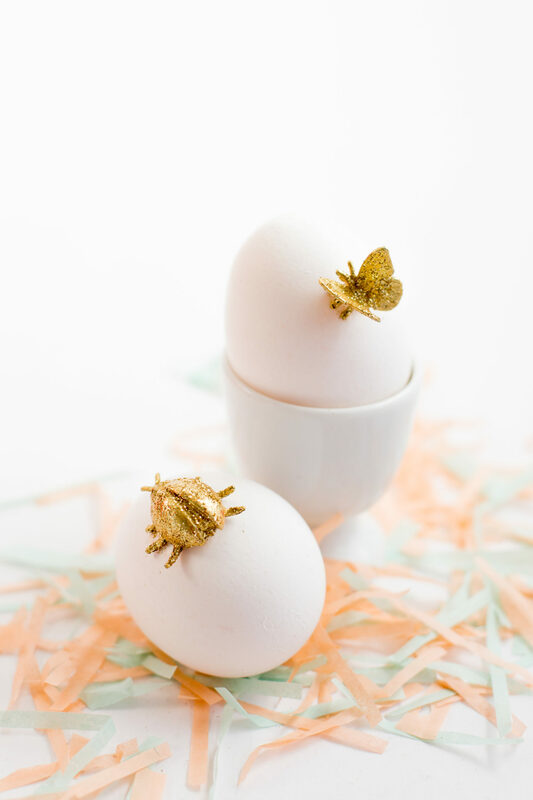 I love the gold against the white, but they would look just as cute atop some dyed eggs as well. This spring is very sad for me because I just found out my Father is terminally ill with melanoma. There is so much sadness in my heart right now. These gold beauties help raise my spirits just a bit. This DIY is quick and easy. So round up some animals and a little paint and glitter and have at it! Don’t forget to grab your family and friends and tell them how much you love them! :: Paint each little figure with gold paint. I did about three coats (four with the darker animals). :: During the last coat of paint, sprinkle glitter atop the animals. 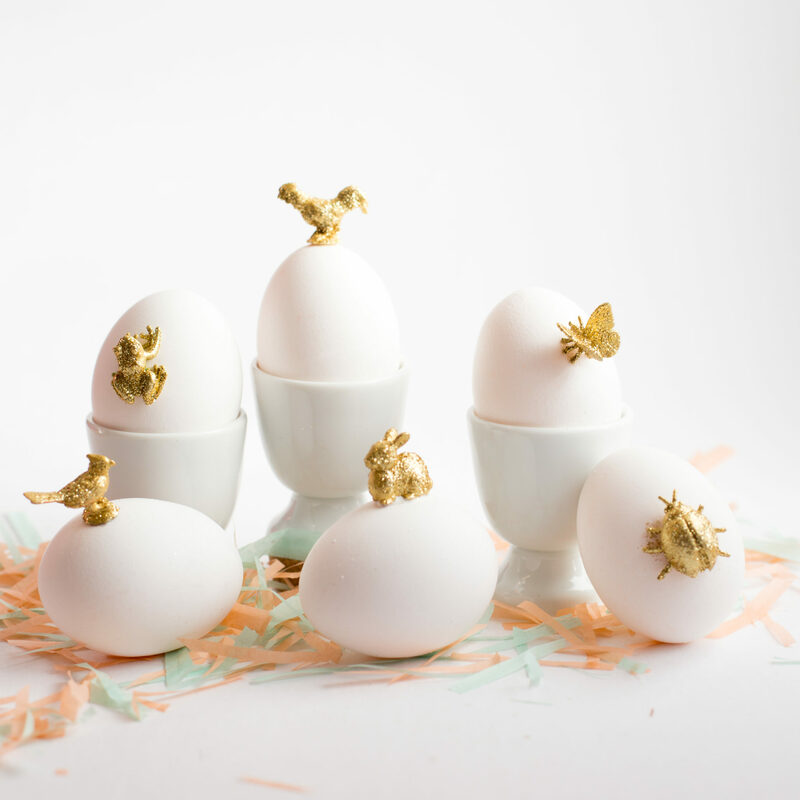 :: Glue each figure to hard boiled egg with craft glue. I held each animal in place for about 4 minutes for the glue to set. :: Cut tissue paper with fringe scissors for grass. Easy as pie. This project is in association with the #12MonthsofMartha blogging team. I am so sorry to hear of your father’s illness. You are all in my thoughts and prayers. Suzy, You are so kind to take the time to do so. Thank you for your thoughts. I am so sorry, Anne 🙁 Will be keeping you and your family in my prayers. These are so beautiful. I’m very sorry to hear about your father. I’m thinking of you. Thanks so much Abby! your thoughts are appreciated. I’m so sorry to hear about your father. My thoughts are with you and your family, Anne. turned out wonderful. Thanks for sharing another holiday craft project! Looks beautiful – Love that you recycled them. Thanks so much for sharing with me! Wow! These look gorgeous. So cute! This is the first time I’ve come across your site and just wanted to say how much I love these easter eggs. I’m sorry to read this about your Father. Hope you are doing ok.
Hi Hayley, Thanks so much for your your comment and thoughts. I’m so glad you love the eggs! These are super duper cute! I love them. 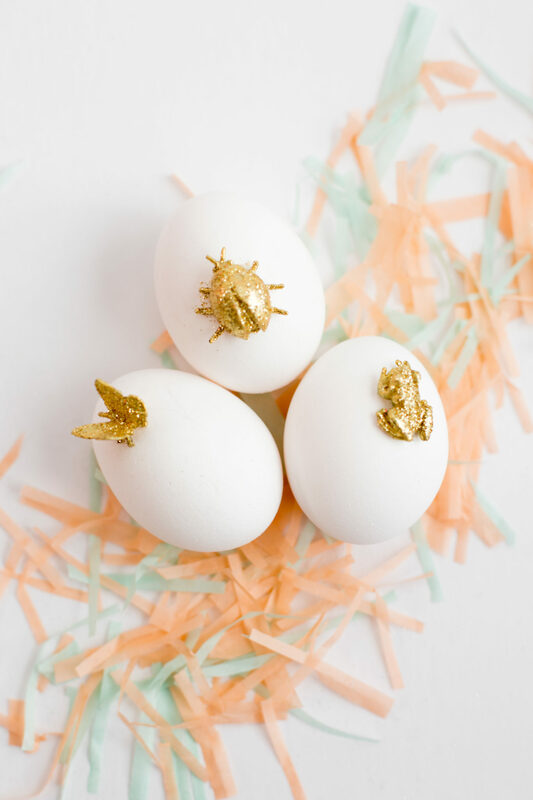 I have one week till Easter…and I might have to do this craft! Thanks for sharing! All the hugs for you. This is the best egg idea I’ve seen this year! So simple and gorgeous. This is such a lovely idea! So sorry to read about your father, I hope you have a good Easter. Have I ever told you that your blog is always the find place I want to visit every day? This blog is the brightest, cutest, and the most beautiful one I ever seen. It evens inspire me to achieve the perfection (I know it’s impossible, yet as close as it can be). Thank you for inspiring me by the simplest way. Huong – You are so so sweet. This comment absolutely made my day – don’t worry about perfection but just create and make and do things that make your heart sing!